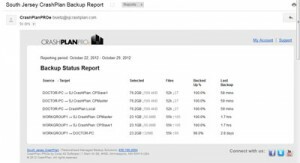 Why choose South Jersey CrashPlan for your backup needs? South Jersey CrashPlan is a cloud based backup service offered by The Byte Shop, LLC. We are a local service provider serving our community, working to provide you with great service at an even better value. In order to do this, we are leveraging CrashPlan PRO Enterprise, a HIPAA compliant enterprise-tough online data backup solution to protect your critical digital content. For over 25 years, we have been working with businesses stressing the importance of data management, data backup and recovery. We provide the best solution available with the most current and reliable technology. As a small business we know the importance of keeping your data safe and doing so at a reasonable cost. We know your data is important so we make sure your backups are encrypted and sent to two different offsite locations. We will also configure the software to keep an additional copy of your backup archive on-site for fast restores of large files or to restore files if there is an interruption in your internet service. Additionally, we provide an optional electronic data safe; a rugged, fireproof and waterproof hard drive for additional on-site protection. Unlike other online service providers we work directly with you to help install and maintain a running backup environment, choosing the right files and folders to backup, and we can help you with any restores. In addition, we keep a close watch of your backup status to make sure everything is running properly. We get copies of your backup reports and review them even if you don’t, and take appropriate action if necessary. At The Byte Shop, we strive to ensure that everything works just right for you. Let us show you how our South Jersey CrashPlan service can work for you. We’ll set you up with a free trial and then its only $20 per month for two computers. Check out our rates for more details.